Empowering Children is a powerful tool for parents and others interested in raising children to the crowning height of their individual potential. “Empowering Children” is a powerful tool for parents and others interested in raising children to the crowning height of their individual potential. The jeopardy of children in today’s world is revealed at length, with camera angles on internet dangers, child abuse, sexual predators, domestic violence and ecology issues. Parent and family roles are discussed. There is a chapter on Dr. Malkin’s hundreds of motivational talks in the classroom. The author takes us on a global journey, examining the empowerment needs of children in the most desperate conditions as well as those in better circumstance. This is essential reading for parents, grandparents and teachers! Covers a LOT of great topics. The dangers that our children face are discussed with candor. If you have children, I suggest that you read this and follow the advice. Well done. The hype says this is a powerful book... and the hype is correct! 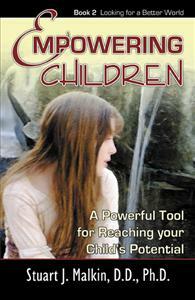 The focus on child endangerment is excellent, with accurate and specific advice. And I found the empowerment problems around the world to be interesting. Wow! I have two young children and I must say that this book will be very helpful to me in my parenting. I just never thought about the many kinds of things kids can get into... now I not only am more aware, but I know what to do to prevent a problem! If you are a parent, read this! Hard to say what the best part of this carefully written book might be. Certainly the descriptions of the lives of the African children will get to anyone who has a heart! But the dangers that children face and Dr. Malkin’s description of those dangers is a section not to be missed. The author's classroom visits were on target and the children's comments revealed how much he is "right on" in interacting with the children. I guess "empowerment" is the perfect word. An easy read, well written and full of really good information. The subjects covered are essential things that parents, teachers and others should have at their fingertips as reminders of the things we need to do to motivate and protect our children. It is all here in one place, described accurately where necessary and passionately where appropriate. I don't beleive I have ever seen a "parenting" book that is as comprehensive. The many subjects are a wonderful resource. And the Appendix is filled with great stuff. You gotta read this!